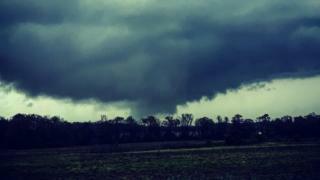 A series of tornadoes have struck parts of America. Rescue teams are working hard to help those who've been affected in the US states of Alabama and Georgia. Thousands of homes have been left without power. Some people have been injured and at least 22 people have died. Officials have said they're dealing with a "catastrophic" situation. 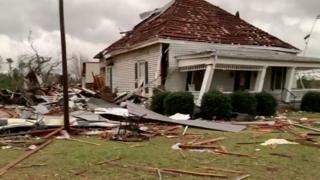 The National Weather Service recorded winds of up to 165 miles per hour. Tornadoes form when warm, moist air meets cold, dry air. A thunder cloud may also begin to build. The warm air rises and as winds move around each other at different heights and speeds, a spiral of spinning air forms known as a vortex. When it hits the ground, that is when it is called a tornado. The air in a vortex spins at over 480 km/h (300 mph). A tornado can last from several seconds to more than an hour and may travel dozens of miles.